One of the beauties of having this blog is that I pretty much explore and examine whatever I like as it relates to my web theme. The civil war, being an era of much slower communications and pace-of-life, had me in a dilemma regarding material to use in a regular and timely fashion. JWD wrote over 40 letters in the 4 years covering his service in the war, but spacing them out over the 47 months of his service leaves me with less than 1 per month. I struggled with the idea of how to fill the gaps and as I have writing in prior posts, I have been using mostly artifacts contained in either the letters or his archival records to provide context for his life. Now I will expand by researching elements in the letters and connecting them to other elements I have been researching online and in books. Nothing really new….just connections. During the past week while reading a letter JWD wrote in April of 1862, I ran across his reference to a ship he was on during the movement of the 48th PVI to Hatteras Island, NC during their North Carolina expedition. JWD references the “George Peabody boat” in his letter dated April 7th, 1862. I decided to study this ship a bit more and see what information I could find about a troop transport that carried my GG Grandfather. I admit that I get a little thrill in finding connections to obscure little items that have, or may become, forgotten. So…what was this “George Peabody boat”, he writes about? Was it a big warship? Was it a commercial sailing ship? Was it a military transport? A steamboat? What else did the “George Peabody boat” do? What happened to it? All of these types of questions are what make doing this blog all the more fun. Seemingly insignificant questions on obscure elements of the war can help with retaining the history that would otherwise be forgotten in time. Fortunately, with the internet, most of these elements will never be lost...and I take no credit for reiterating that which has already been stated. Hopefully, I am able to bring “linkage” between those elements and these letters which have never before been connected. February — Freedmen's Colony established during the Federal occupation of Roanoke Island. Former slaves built a thriving settlement, erecting churches and schools. 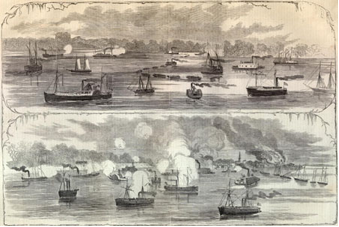 March 14 — Battle of New Bern — Casualties: roughly 1,080 on both sides. March 23-April 26 — Siege of Fort Macon — Casualties: roughly 490 on both sides. June 27 — Blockade-runner Modern Greece forced aground by Union blockaders. Artifacts from this wreck are currently on display at Fort Fisher (Cape Fear). June 27 — 1st North Carolina Volunteer Infantry (Union) organized (as authorized by Gen. Ambrose Burnside). So…the “George Peabody boat”…. aka… the USS George Peabody, was a converted steamship probably used as a short haul passenger boat of the day. It was a side-wheeler with the propulsion paddles being on the side of the ship. The first account of the Peabody I can find show that it participated on August 31st, 1861 with the capture of the Confederate brig Henry C. Brooks in the Hatteras Inlet. The Peabody, along with many larger support vessels provided a key link the in the blockade chain enacted by the north during the war. 1861 was a year of easy pickings for the northern fleet as the south tasted the first indications of the northern strategy for “starving” the south. 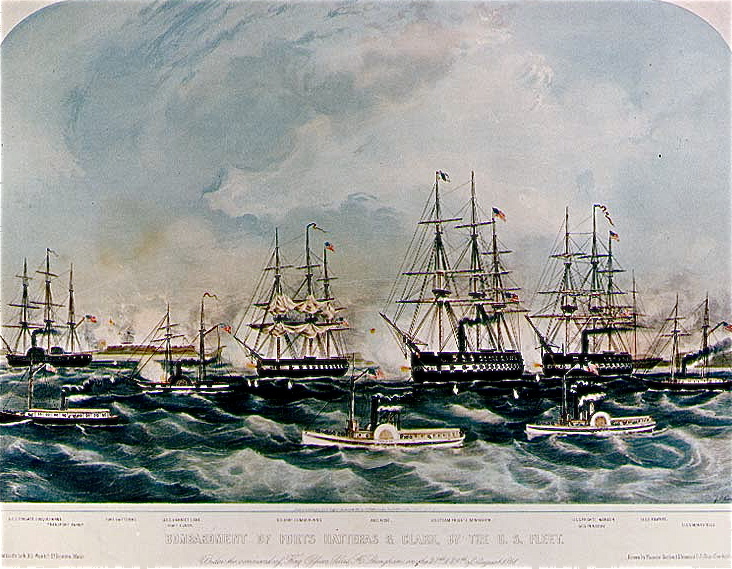 Later in 1862 the USS George Peabody participated in the both the troop transportation for the Burnsides expedition as well as the bombardment of the confederate forts Clarke and Hatteras. Based on the pictures I have found of the Peabody, this most certainly was in a supporting role with the actual cannon bombardments being done by capital ships of the line. The last account I could find was regarding the sinking of the West Point in a collision with the USS George Peabody at Ragged Point, Maryland on the Potomac River on August 12-13, 1862. Could the Peabody have been lost in that collision too? The records seem to indicate not….a A record of an 1862 repair of the USS George Peabody shows that work was done on the ship at the Skinner Shipbuilding at their facilities in the Baltimore Inner Harbor. A further reference to the Peabody off the coast of Texas in October of 1863 seems to indicate that the ship operated there after the collision.. That reference seems a bit strange to me given the apparent size of the vessel, though coastal support might be a realistic role for the USS George Peabody. Morning of October 31st found us on place of rendezvous, assigned by General, where we found a dispatch boat and soon others followed till afternoon when Generals Banks and Dana, in their boats ordered us into proper line, but 7 vessels of the fleet were still missing. On the 1st of November by 4 p.m. we dropped anchor near Brazos San Diego. Private (later sergeant) Benjamin F. McIntyre kept a record of his service in the 19th Iowa Infantry. Tilley's annotated The Federals on the Frontier: The Diary of Benjamin F. McIntyre 1862-1864 details his experiences in the Rio Grande Expedition. He and fellow infantrymen commanded by Col. Kent boarded the Gulf steamer General Banks at Carrollton, Louisiana on 10/23/1863. The entire fleet according to Major John Bruce's 19th Iowa report consisted of 16 large vessels and three gunboats.There was also anumber of schooners used for troop, munitions, and provisions transport. The convoy left New Orleans on the 24th. Also aboard the Gen. Banks were two companies—15th Maine and a portion of Battery "B" 1st Missouri Artillery. The captain of the Banks complained at the excess number of personnel brought aboard but to no avail. Sunday, the 25th, saw the ship anchored off the lighthouse at the Southwest Pass awaiting the arrival of other ships to be in the convoy. Lt. Col. Benjamin B. Murray Jr. of the 15th Maine was the ranking senior officer aboard and excersized his privileges much to the chagrin of the Iowa officers over the 239 enlisted Iowans.After an inspection on the 27th, 60 rounds of cartridges were issued to each soldier. The fleet departed the Mississippi Delta that evening and the very next day began to encounter rough seas. With 23 vessels in sight of the Banks, a gale commenced on the 29th. This however was not the peak of the storm; that was to arrive the next day. Soon a flag of distress was raised on the masthead of the Banks. Col. Murray reluctantly consented to having the eleven mules aboard, one battery wagon, and other items such as forage thrown overbaod and "deep-sixed." The fact of the matter was that many vessels of the fleet that had been requisitioned by the Federal government had years before been condemned. On the 31st with its fuel nearly exhausted the Gen. Banks was taken in tow by the Empire City. It had been taking on water and was in very poor physical state due to the battering by the waves. Captain Edward Gee Miller of the 20th Wisconsin was another who described the rough seas. He noted one sailor being swept overboard and lost. In a later report after landfall had been made by the fleet, Commander J. H. Strong of the gunship Monongahela reported that one small steamer, one schooner, and one launch had been lost in the storm, but all hands aboard them had been rescued. Among the vesels that made the journey were the George Peabody; Thomas A. Scott with Captain Chester Barney; the flagship McClellan with Generals Banks and Dana aboard; the General Banks, formerly the Creole; Empire City; Monongahela; Crescent; Drew; Belvidere; Bagley; Owasco; Zephyr, a transport saved by the Owasco; J. W. Hancock, a tug that sprang a leak off Brazos Island on 11/4 and was run ashore in several feet of water; Nassau, lost on the Brazos Santiago bar due to its excessive draft and poor manuveurability; and the Clinton, a new steamer of the Crescent City Line. On the 24th of October 1863, our division embarked at Carrollton on Steamer Belvidere, reaching the mouth of the Mississippi and the Gulf of Mexico on the 27th, and after a tedious and stormy voyage, during which storm to save the ships the cavalry horses of the command were thrown overboard, and on the third of November arrived at Brazos de Santiago. Nine days were occupied in the passage for which three was the usual time. Nearly all were very sea sick, and during the 30th, men lashed themselves to the sides with ropes, otherwise they would have been washed overboard. While the worst part of the passage was behind them there still awaited some dangers associated with landing. When the fleet did arrive off the island, seas were still too rough to chance a landing that day. Some of the larger vessels let the cavalry horses swim for shore. The George Peabody, the ship carrying some of the First Texas Cavalry, slung twenty-five horses overboard; only seven made it to the beach. Even the next day as the surf had subsided somewhat two sailors and seven soldiers drowned when a boat from the Owasco was swamped during the embarkation. A dispatch dated Nov. 3 states "Commenced landing by lighters and small boat on Brazos Island, consuming several days, and losing two steamers and two schooners." I will share the related letter from JWD later in April of next year. February 5, 1865, the 21st Iowa and 47th Indiana embarked on the Geoge Peabody at New Orleans, LA for Dauphine Island, AL, arriving there late on February 7, 1865. An excellent drawing of the Geo. Peabody, drwn by Alfred R. Waud is located in the Library of Congress Prints and Photographs Division. The S. S. George Peabody was a United States Army Transport, not a U S Navy vessel. They at times, would be armed and support naval vessels in blockade duties, especially in shallow coastal waters. They would carry a few field pieces and infanrty for close in work.Most of the US Army Transports were under contract, but many blockaderunners joined their number directly after capture, such as the Alabama and Warrior captured going into Mobile which ended up as Army transports along the coast of Texas. Thank you "Anonymous" for the clarifications. I appreciate it. I wonder if the picture you reference in the Library of Congress is the same one I posted on October 11, 2011? The differences in size and charateristics of various reports may be attributed to the Sailing ship George Peabody, this ship was formerly an A-1 surveyed fine clipper ship of the 1850s which was shoing its age and it was pressed into service for the Banks Expedition. The Sailing ship George Peabody Carries the 4th Mass Vol Infanry into Carrolton, New Orleans. Fantastic! Thank you for the information. Would love a photocopy of your print to show on the blog! Thank you! I sincerely appreciate the offer. You can send the file (assuming you have it scanned) to jwdletters@gmail.com. Please let me know your name so I can attribute the sharing to you! Thanks again.